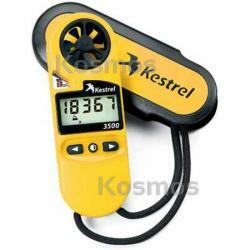 Krestel 3500 Pocket Weather Meter, Kosmos Scientific de México, S.A. de C.V.
New for the fall of 2004, the Kestrel 3500 measures every environmental condition simply with the press of a button! Operating Temperature LCD readability is lost above 50ºC (122ºF) and below -15ºC (5ºF). Accurate readings may be taken beyond these temperature limits by exposing the unit for the minimum time necessary to take and record measurement. Temperature Limitations The Kestrel temperature sensor is able to measure temperatures as low as -30C (-22F) and as high as 70C (158F). The Kestrel is able to display wind chill measurements lower than -30C, depending on wind conditions. It is also able to display heat index measurements above 70C, depending on humidity conditions. The Kestrel display will not function if the display itself gets below -15C. However, if the unit is kept in a pack or pocket or other warm area, the display itself should not get this cold. Patents 5,783,753; 5,939,645; Other patents pending. Certification Wind speed, temperature and humidity measurements are tested at the factory before packaging. Factory certification is available for additional fee. Warranty Standard 2-year warranty covers parts and labor.